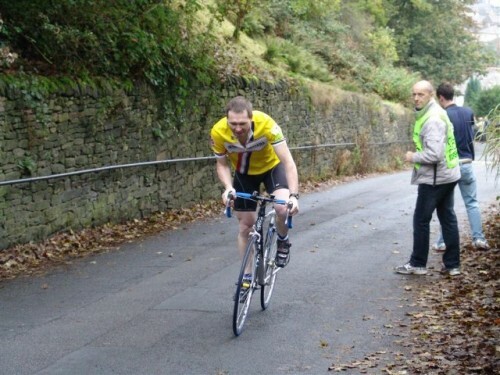 The 2012 championship was held on the Rake, a short brutal climb from the town of Ramsbottom. The race was well organised by Lancashire RC, with a closed road, and despite the weather, a very good crowd. The deserving winner was Jack Puller (Wheelbase.co.uk) in a very good time of 2.21. Under better conditions, the course record may have gone. Last years’ winner G.Gronlund pulled out a good ride to finish second and Matt Clinton finished third. The womens’ winner was Lynn Hamel Team Herbalife/Leisure Lakes Bikes. The only last minute change I made to my bike was putting on a heavier road tubular so that it was less likely to slip in the forecast wet weather. On Sunday, there was a fine drizzle throughout the day which doesn’t make the Rake any easier. As Peter Kay would say that fine drizzle that soaks you through. I was warming up on my turbo and rollers. (long story why I was using both) but, managed to keep fairly dry. I had a bit of pre race nerves on Saturday, but once on the bike felt fine. The race went pretty well until the really steep bit, somehow I found myself massively overgeared, and slowed down quite a bit (it reminded my of climbing Wrynose pass earlier in the year into a headwind on a 39*23 earlier in the year. This was even more unpleasant, despite a very generous crowd cheering me on. 13 is my lucky number, so I was happy to be wearing number 130; though I was slightly less happy to end up finishing 13th. I was never really going to shine on the Rake, but I could have ridden the climb better. Anyway, it’s all a good laugh really…. Personally, its a bit disappointing the last two national championships haven’t turned out too well (for different reasons). I don’t think it was mistimed form, just using wrong bike in 2011 and ending up being over geared on a climb that didn’t play to my strengths. Well the good news is next years hill climb will be on a different climb, so hopefully it will turn out a little different. I shall now go and have a piece of chocolate cake and put the feet up for at least one day, before beginning winter training. I shall be doing lots of miles, but not necessarily up short steep hill climbs. I can at least claim one bragging right from the season as the only person to go faster than Jack Puller on a hill climb. He is unbeaten in all hill climbs ever. But, in 2012, I went 2 seconds quicker on Jubilee Tower a few weeks after he did it. (It was on a different day so not comparable, but it still kind of sounds good – in a clutching at straws kind of way ) I bit like the rather hollow boast last year I beat Michael hutchinson in a time trial when I was on a road bike, and he was on a TT bike. Thanks for comments. Only 11.8 months to next years national championships! ideas re guinness 24 hour hill climb attempt just wondering !! not sure about which gear I was in. You can take a lot of pride in all the years of training that have allowed you to even be in the mix at an event like this. I’ve really enjoyed following the build-up to this, by the way. Good luck for next year. another amazing season though Tejvan. I was also overgeared, running up the last bit (and all the climb) in 39:18.
character-building. see you up the road! Hard look Tejvan, but it’s all about next year, The Stang is your climb. I was thinking about your 24 hours climbing, how about The Bwlch (Hill 99) in south Wales. There are 3 climbs that finish at the same spot. 1 maybe a little shallow but the other 2 are just about right, you have to go have a look. thanks Simon. I’ll check them out. Though I’m always worried Wales has a higher chance of rain! I looked at tumble too. Bad luck Tejvan, perhaps short, steep climbs aren’t really your thing, but hopefully next year the national hill climb championship course will be long and flat(ish!). Keep up the cycling though, and ensure to continue posting many a fun, helpful and interesting article on this blog.